MONTEREY, Calif. (AP)  Thrilling visitors and scientists alike, the only great white shark currently on display anywhere in the world marked its 17th day in captivity Friday, setting a record for longevity in an aquarium tank. 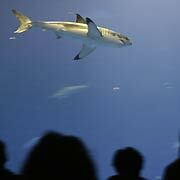 Visitors to the Monterey Bay Aquarium watch as the female great white shark swims Friday. The young female, captured off the coast of Orange County in August, spent the day swimming with tuna, stingrays, barracuda and sea turtles at the Monterey Bay Aquarium's massive, 1 million-gallon Outer Bay exhibit. Unlike dozens of past attempts around the world to keep the great whites in captivity, this predatory fish continues to eat and shows no signs of stress, said Randy Kochevar, the aquarium's science communications manager. "Everything seems to be going great," he said. The previous record-holder, a great white held at SeaWorld San Diego in August 1981, was released after just 16 days in captivity. In fact, all other known attempts to keep one in captivity lasted 11 days or less. The Monterey Bay Aquarium, which last had a white shark on display in 1984, took several steps to help this shark adjust to its new home. After it was inadvertently snagged in the nets of halibut fishermen, the shark was moved to a 4 million-gallon pen off the Southern California coast. Researchers believe it got used to living in an enclosure before it was trucked to Monterey a few weeks later. Immediately after it was put on exhibit, aquarium carefully watched the animal 24 hours a day for any sign of trouble. Now, it's monitored by surveillance cameras late at night and staff during business hours. The animal's young age — and size — also probably helped, Kochevar said. It's 4-feet, 4-inches long and weighs just 62 pounds. Researchers believe it's about a year old. A full-size female great white shark could grow to about 21 feet and weigh more than a ton. At some point before it reaches maximum size, it will likely be moved elsewhere or returned to the Pacific, Kochevar said. It also will be returned if there's any evidence its health is suffering because of captivity. In the meantime, researchers will be studying the shark's behavior, growth rate and food consumption in an attempt to answer questions about the little understood species. But the aquarium's primary reason for keeping it in captivity is to show her off to visitors who might have picked up some misconceptions while watching the 1975 movie "Jaws" or reading about recent shark attacks. "The reason we have her here is so that our visitors can have the experience of seeing this animal fact-to-face," Kochevar said. "This is what we have found to be the most effective way of changing people's attitudes and behaviors about animals in the wild." Attendance has jumped 50% since the shark's arrival, compared with the same period last year, he added.